With a personal contract hire agreement you take control of a vehicle for a contractual period – usually referred to as the ‘lease period’. You will make fixed monthly payments for the duration of the contract – when the contract expires you will simply return the vehicle and take out a new personal contract hire lease. PCH means you never have to worry about resale values of your vehicle. 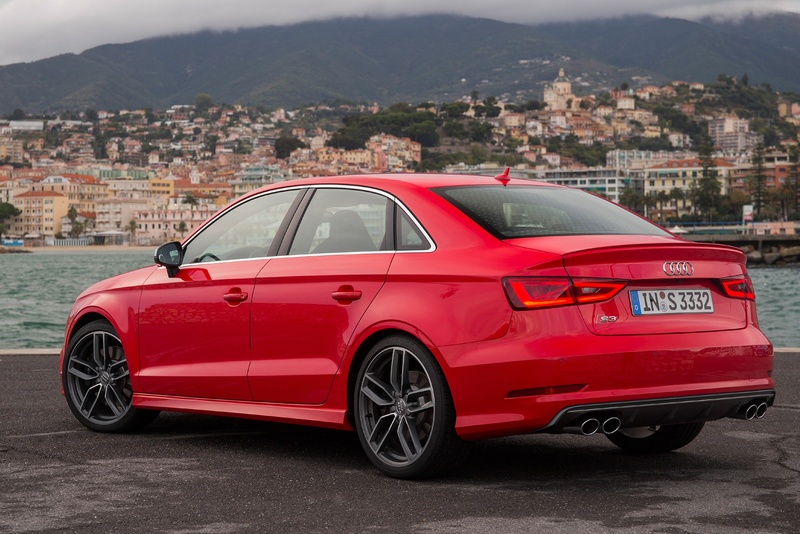 The Audi S3 Saloon takes the existing and successful S3 hatch and adds a boot to it, decimating its likely sales in the process. 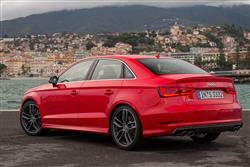 While a four-door S3 is still a lovely thing, it's going to appeal to a niche within a niche. Still, that 300PS two-litre turbo engine and four-wheel drive chassis combination fits the classic middleweight sports saloon genre to a tee. 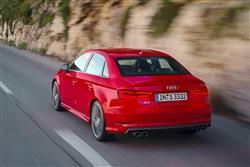 To those of us who care about this sort of thing, the Audi S3 has always been a fast hatchback. Whether you got three doors or five, it didn't much matter. It was always furnished with a tailgate and that put it in with a very specific group of cars. More to the point, it lumped it in with a group of rivals that it could usually administer a sound battering to; cheaper models without the benefit of its all-wheel drive chassis or sumptuous build quality. That market has changed in recent years and so has the S3. It's now available as a saloon, looking for all the world like an Audi S4 short of a bit of growth hormone. The addition of a boot on the back shouldn't change things that much but it does. Sports saloons grow bigger and tougher than hot hatchbacks and the S3 Saloon has to face down some scary rivals if it wants to succeed. To most in this category, a sports saloon with four-wheel drive, a 2.0-litre turbo engine and a tall stack of attitude means either a Subaru Impreza WRX STi or a Mitsubishi Lancer Evo, both echoes from the past that nevertheless cast long shadows. Can the S3 Saloon match these performance icons? In terms of sheer pace, no. Nevertheless, it'll get to 62mph in a mere 5.4 seconds and keep going to an electronically limited 155mph, which is hardly hanging around. Although at first glance the 1984cc turbocharged engine looks similar to that which has gone before, it's completely different with a clever way of using direct and indirect injection to best effect. With twin balancer shafts and a long stroke, Audi claims it develops very a very smooth serving of torque; fully 380Nm all the way from 1,800 to 5,500rpm. That's impressive. 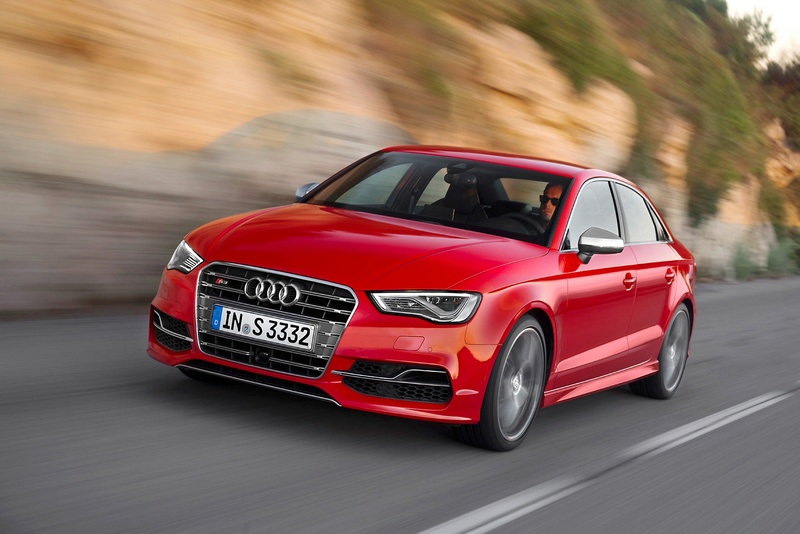 The S3 is equipped as standard with a manual six-speed transmission with a lightweight magnesium case. The optional S tronic twin-clutch transmission features high efficiency and a tall sixth gear. The lower gears are short in the interest of dynamics, as is also the case with the manual transmission. The heart of the quattro all-wheel drive system is an electronically controlled and hydraulically actuated multi-plate clutch. In the interests of balanced axle load distribution, its located at the end of the prop shaft, in front of the rear axle differential. During normal driving, the clutch sends most of the engine's power to the front wheels. If traction decreases there, the clutch can transfer torque steplessly to the rear axle in just a few milliseconds by forcing the packages of plates together via controlled action. 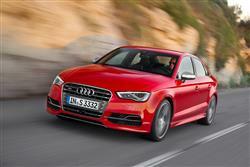 Audi drive select is standard in the new Audi S3. It incorporates the characteristics of the electronic accelerator, the boost of the progressive steering and the shift points of the optional S tronic. The driver determines with the push of a button whether these systems operate in comfort, auto, dynamic, efficiency or individual mode. In individual mode, drivers can compose their own preferred profile within certain limits. 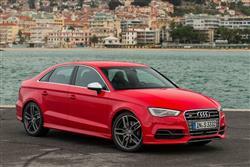 Yes, the S3 Saloon does look astonishingly like an S4 that's been scaled down slightly. While some might not be fans of Audi's Russian Doll styling, there aren't too many surprises about the look and feel of this one. Given the upward trajectory of Audi's sales figures, perhaps that's no bad thing. So while it doesn't score well for originality, the S3 Saloon gets solid marks for execution with an S-specific single-frame grille and front bumper, aluminium-look exterior mirrors, pronounced side sills and a redesigned rear bumper incorporating a platinum grey diffuser and cut-outs for the exhaust system's four oval tailpipes, which feature chrome tips. 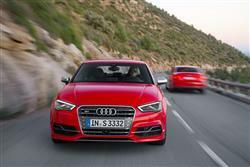 The boot's carrying capacity amounts to 390-litres with the seats up - 50-litres more than the S3 Sportback. 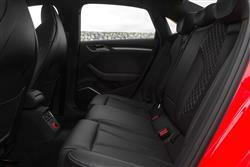 This capacity can be increased by folding down the split rear seat backs. The boot lid automatically swings upward when the release button on the key or the touch pad on the lid is pressed. The interior is classily executed with grey instrument dials using white needles, while the rev counter includes a boost pressure indicator. Between the dials, a driver's information system with rest recommendation supplements a 5.8-inch power-retractable on-board colour monitor. You'll also find a flat-bottomed leather multifunction sports steering wheel with S3 logo and aluminium-look shift paddles in S tronic-equipped models, as well as aluminium pedals and footrest and heated Nappa leather-upholstered sports seats. Audi will ask just over £33,000 of you for an S3 Saloon with a manual gearbox, but most customers will add another £1,500 to that asking price for the S tronic twin-clutch gearbox. Dual-zone electronic climate control is fitted as standard, as is MMI, a sophisticated infotainment system that's well worth taking the time to master. There's a slimline, power-retractable, seven-inch monitor and 'MMI touch' integrated into the top of the rotary push button. The 'Audi Phone Box' set-up connects mobile phones to the vehicle in a convenient way and the sound system from Bang & Olufsen offers excellent sound quality, with LED light guides adding a bit of theatre to the door woofers. The assistance systems in the S3 come directly from the full-size class. The range begins with adaptive cruise control, which when combined with the safety system 'Audi pre sense front' brings the car to a stop autonomously from speeds below 19mph. Safety technology continues through Audi side assist, Audi active lane assist and camera-based traffic sign recognition all the way to the park assist system that'll steer you into a space. There are also a number of convenience options, including 'adaptive light' for the headlamps (also offered with variable headlight range control), and the keyless 'advanced key' system. The flipside of not being quite as aggressive and fire-breathing as some of the all-wheel drive sports salons of the past is that the S3 Saloon gets some very contemporary efficiency figures. Despite its complexity and high output, the 2.0 TFSI engine tips the scales at just 148 kilograms - shaving five kilos off the weight of the S3's previous unit. This reduction, combined with the extensive use of aluminium parts, helps to pare weight back to as little as 1,430kg. That's not at all bad for a four-door saloon. By contrast, a Nissan 370Z coupe is, for example, a hefty 1,526kg and is slower, thirstier and less practical than the Audi. 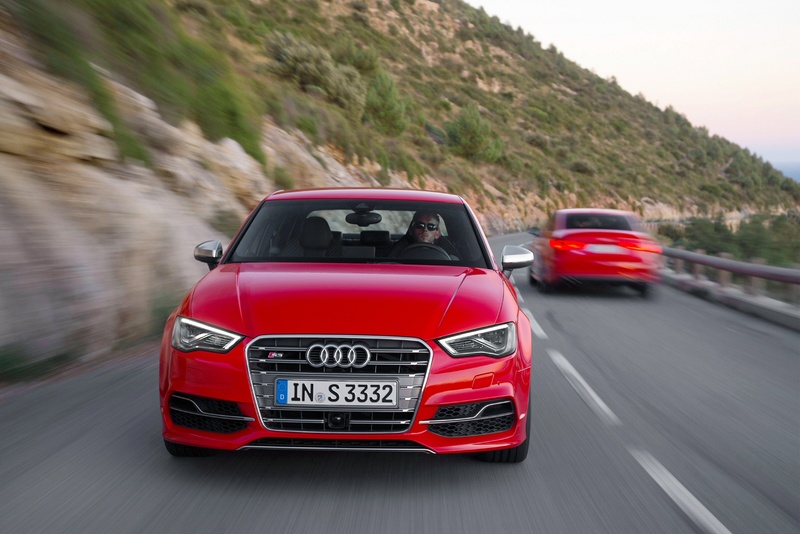 The S3 Saloon records a combined fuel consumption figure of 40.9mpg with the S tronic gearbox and 40.4mpg with a manual 'box. The emissions figures are equally as good, the S tronic logging 159g/km and the manual 162g/km. That difference might well be significant for company car operators. If you’re looking for a new Audi A3 40 TFSI Quattro Sport 4dr S Tronic [Tech] Petrol Saloon for sale, you’ve come to the right place. At Bristol Street Motors we don’t just have the best Audi A3 40 TFSI Quattro Sport 4dr S Tronic [Tech] Petrol Saloon deals, we also offer friendly advice and help with all your enquiries to ensure your buying experience is a happy experience. Terms & Conditions: Every effort has been made to ensure the accuracy of the information shown. However, errors do sometimes occur. The specification of each vehicle listed on the Hereford Audi website is provided by "CAP". Please note that the Images of each vehicle are range shots, these can include images which do not reflect the precise details of the vehicle you are looking at and are purely used for illustrative purposes. The inclusion of such data does not imply any endorsement of any of its content nor any representation as to its accuracy. We do not charge a fee for introduction to a finance provider; however we may or may not receive a commission.